This time the free design is a classic napkin ring that will suit that special dinner party when you decide to go all out! These stylish needlepoint bracelets are easy to stitch and fun to wear! The above photo shows you our two ‘FUNKY’ bracelet designs. CLICK HERE to see the whole range of these contemporary designs. Whether your taste is funky, refined or even whimsical, there is one just for you! Chic cuff bracelets with lots of flair …perfect for any occasion! And they're also easy to make up …. minimum sewing required! I’ve included two stitches that I think are very important for any serious stitcher to learn… they are the French Knot and the Stem Stitch. They are not difficult to do, and they give your finished tapestry wonderful detail and depth. They are added after you have completed the standard Basketweave stitch on the rest of your tapestry. CLICK HERE to see how these decorative stitches add the final touch to my small purses designs. Bring the needle up through the canvas where you want the finished knot to be. Point the needle away from you and wrap the thread around the needle. Holding the thread taut with your other hand, turn the needle back and put it through the canvas above and to the right of the original hole. To create the stamens on the flowers, work a French knot as described, but re-enter the canvas 3 or 4 threads away to form a knot on the end of the stitch. Work the stitch by bringing the needle up at 1, down at 2; usually 2 threads away. Before pulling the yarn down on the canvas, bring the needle up at 3, and pull the yarn snug to the canvas. Go down at 4, and come up at 2, and tighten the yarn again. You can hold the yarn to either the left or right of the needle when working in a straight line. When working a curve it should be held outside the curve. 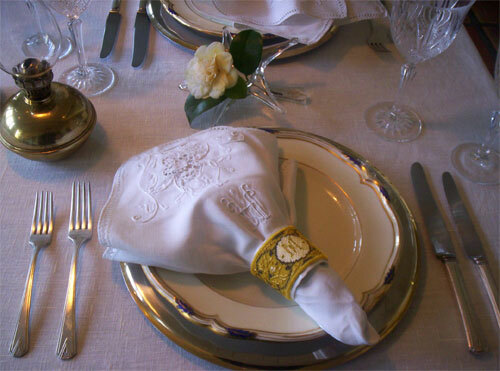 This is very important to master with the napkin ring design in this newsletter. 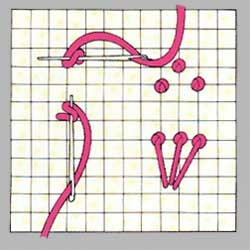 The photo at right is what you want these decorative stitches to look like when you’ve finished practicing them. Don’t worry what yarn you use at this stage, but you should practice with metallic thread at some point before you start these finishing decorative stitches. INSPIRATION FROM 19TH CENTURY FRANCE! This elegant design was inspired by 19th century needlepoint tapestries and embroidered linen I see in antique and second-hand shops during the 15 years of my living in France. Many women in France today still have a passion for stitching these time-honoured designs. 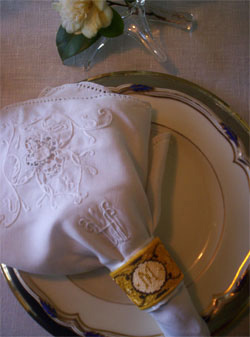 I wanted the napkin ring design to reflect the elegance and delicacy of tapestry designs prevalent from this period. So I created this traditional napkin ring in regal colours of gold and royal blue… accented with silver and gold metallic threads. An elegant final touch to an elegant dinner setting! Please click here if you want more background about this napkin ring design. What is the initial you want for the centre medallion? If you’re a subscriber to the VIVA ZIVA! newsletter, contact me and I’ll send you a free chart with your initial! The entire napkin ring is stitched in the Basketweave Tent stitch, including the centre initial in gold thread. As mentioned above, the FRENCH KNOTS and STEM STITCH are done after you’ve finished the basketweave stitch. To retain the delicacy of the design , I chose an 18 mesh gauge canvas (18 holes per inch) so that the traditional detail would not be lost. The metallic silver threads are shown in red on the chart. All the wool yarn colours as stitched are from the 2 ply APPLETON CREWEL WOOL Colour Range. The remaining yarns, metallic and satin cotton, are from DMC. approx. 10.5” x 16” (approx. 26 x 41 cm ) to make up 6 napkin rings. Mark out, with a fine waterproof marker, the outline of the 6 napkin rings, making sure you’ve allowed spacing of 2-3 inches (5-8 cm) between each one. Note: with 18 gauge canvas, each napkin ring is 103 stitches long x 31 stitches wide. Just as you practiced it, stitch the Stem Stitch and add the French Knots after you’ve completed the background. SPECIAL NOTE: You don’t have to follow my design exactly for the curved Stem Stitch. Finish one quarter of the napkin ring with this stitch in metallic gold to your liking, and then copy what you have done after that for the rest of it. The whole idea is to add some elegant ‘glitter’ to the design. Make it your own creation! For the central medallion, I worked with a very fine embroidery thread, because I wanted its satin sheen to complement the metallic thread and contrast with the mat finish of the wool. I put three strands of the thread on the same needle, and stitched the white medallion in the centre in a basketweave stitch. 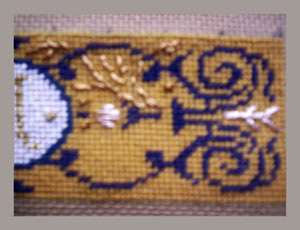 three gold strands on the same needle to create the French Knots and the curved Stem Stitch. 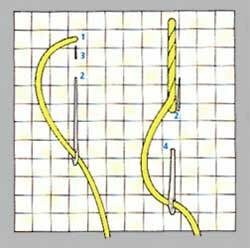 four silver strands on the same needle to create the straight Stem Stitch. TIP: Metallic yarn can be a bit coarse, so keep the thread shorter than you would with normal yarn, so you won’t be pulling it too much. To make up the napkin ring as shown in the above right photo, cut two lengths of gold yarn about 4” each. Create a loop and fasten the gold thread with fabric glue onto the back of one end of the napkin ring as shown in photo above left. I chose a wide white ribbon to mount the napkin ring to with fabric glue. Note: Leave one corner of ribbon unglued, until you’ve finished attaching the second gold thread loop. Link the second gold thread through the first and glue to the back and finish gluing the ribbon at the last corner. You could also finish this napkin ring the same way as the last one in newsletter #1004. Or you could add a decorative button, instead of a second gold loop. Your choice. Your table is set for a very elegant and chic dinner party! Now all you have to do is figure out the menu! I want to try to design a needlepoint seat cover similar to the one that my mother stitched years ago. I’m having trouble figuring out what canvas mesh would be right for it. Could you help me? Thank you, from Beryl, Leeds UK. P.S. Love your designs! I picked your email because it seems like several people who have written in have the same problem. First of all, if you’re going to make a seat cover, the best canvas, no matter the gauge or mesh size, is evenweave canvas. Because it’s woven, it will ‘give’ a bit when you sit on it, which is what you want. Interlock canvas does not ‘give’, so may snap with wear, which is definitely not what you want! With canvas mesh, the higher the number, the more holes per inch... for example, 32 holes per inch for extremely fine work, such as ‘petit point’, to as few as 3 or 5 holes per inch, which is used mainly for rug making. Depending on the detail of your design, 10-12- or 14-mesh are the most frequently-used meshes for cushions, chair pads and seat covers. The more traditional designs from the 18th and 19th century are at least 18 gauge mesh. This allows you to create a lot more detail. You could also use Penelope canvas which is a double gauge canvas… excellent for creating fine detail if required in the centre of the seat cover design, and a larger stitch for the surrounding background. CLICK HERE to review more canvas mesh information including diagrams of each type, which should help you further. The above photos should also help. They are a good example of how to combine the best canvas mesh with the design. The photo above left shows the ’Like a Rainbow’ napkin rings from newsletter #1004. It was stitched at 12 gauge, because it’s a fairly simple graphic design. 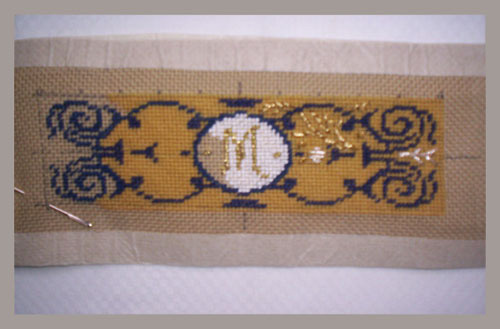 Compare it to this newsletter’s napkin ring ‘Camille’, which was stitched at 18 mesh to ensure the detail was not lost and to reinforce the delicacy of the design..
Good luck with your project, Beryl! I can happily report that my cushion designs are in great demand! So I’ve decided to add more! There will be more Art Nouveau designs and a new section for Abstract Cushion designs. I hope you’ll like them! The next VIVA ZIVA! Newsletter #1006 will be issued in July 2010 . Free needlepoint design for a small TOTE BAG … perfect to stitch on your summer holidays, ready to wear in the fall! !